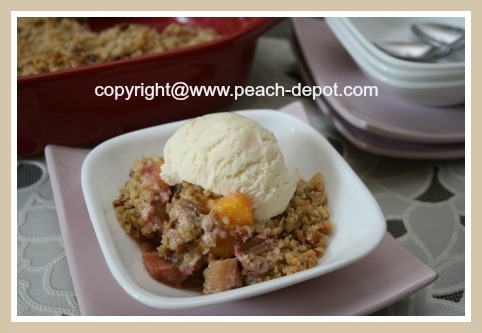 This Oatmeal Crumble Recipe can be used for almost ANY fruit crumble you wish to make. 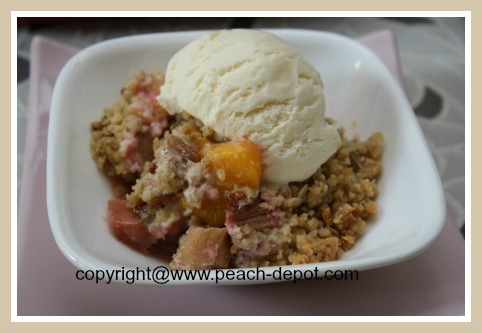 I made this topping recipe to make a Rhubarb Peach Crumble with fresh peaches and rhubarb. You can easily substitute the peaches and rhubarb with your choice of fruit. I like to make a double (or triple), batch of the oatmeal crumble topping, and keep it refrigerated for up to several days. Then, whenever I decide to make a fruit crumble, I already have the topping ready to go, and once I prepare the fruit, I have a fabulous fruit dessert ready in minutes! Note - if you are using frozen rhubarb for this recipe, strain it in a sieve, over a bowl, and discard the excess liquid. Combine the sugar, flour and cinnamon in a small bowl. 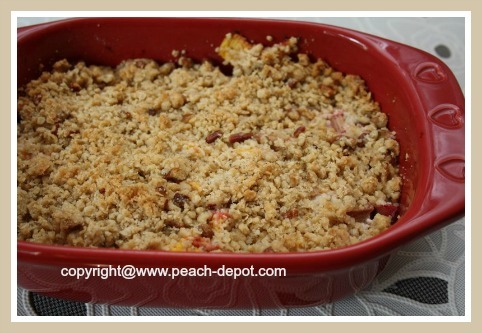 Add the chopped rhubarb and the peach slices to a greased 8" x 8" or 9" x 9" baking dish. Sprinkle the fruit with the sugar, flour and cinnamon mixture, and toss to coat fruit. Using a fork, combine the flours, oats, brown sugar, salt and the nuts together in a large bowl. Using your fingers, mix in the cold butter pieces, until the oatmeal crumble mixture resembles coarse crumbs. 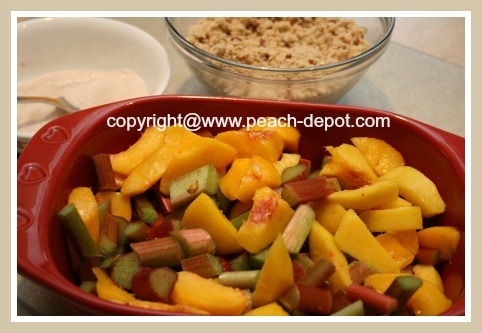 Sprinkle the oatmeal topping over the peach slices and rhubarb pieces in the baking dish. Bake the crumble at 350° F for about 45 minutes, or until the fruit is tender, and the topping is golden in colour. Serve this scrumptious crumble warm, or at room temperature, with ice cream, whipped cream, whipped dessert topping, or a spoon of yogurt. Scrumptious Fruit Crumble with Oatmeal Topping!